My latest post brought this one to mind. What a great trip that was! 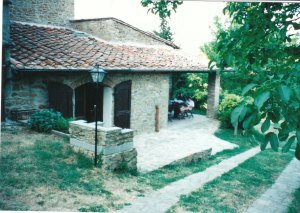 During the summer of 2001, eight of us friends rented a villa outside Panzano, Italy on a working farm. The owners lived in the other wing of the house and grew grapes and olives. They also kept a couple of horses, Oskar and Luna, for riding. Our group enjoyed looking at the rolling hills, watching the horses graze while we sat on the flagstone terrace as the sun set, and talking until late at night under the stars. The villa was our home base for a week while we explored Siena, Florence (Firenze), Montalcino, Montepulciano, and Panzano itself, which had charming restaurants and a renowned shoe-maker. We also cooked a lot of our meals and went through a ridiculous amount of the local wine.